This is a continuation of my previous posts. Please read the previous posts here. As usual, the amazing trip to Bangalore was coming to an end and it is always hard to say goodbye. This time I knew I would see him in a months’ time but it still felt too long. The day before the flight, he took me for a nice quiet dinner and we talked about our future in Australia. It was an honest conversation where both of us shared our plans, hopes and happiness. I wished the evening would never end but we had to sleep and pack my bags for the next day. When we were got back to our serviced apartment, AS went to take a shower and I was to pack. Instead of packing, I was in panic mode as I seemed to have too many stuff to pack. I was taking AS’s stuff as well as my shopping so there did not seem to be enough space in my suitcase. AS calmed me down and helped me pack and it was done in no time.After packing, it was time for bed. The next morning the sun rose as any normal day but both of us were a bit emotional when we were having breakfast. We both knew our future ahead but at the same time we needed to say goodbye, hopefully for the last time until we were together for out happily ever after. After breakfast, we called the same driver and made sure he would come and picks us up in time. Then we had a few hours to kill so we went for a walk to the nearby market. AS decided it was best I had a light snack before I left so he took me to a snack place where I had samosa and rasabri. The ride to the airport was smooth. After I checked in the baggage, we had a few hours together before I had to go inside to clear immigration and board my flight to Sydney. It was a very sad few hours because both of us were going to part again. We just sat in front of each other and stared without talking for a while. I wanted to say a million things but I had no words and then we heard the announcement to board the flight. It was an emotional goodbye for a few weeks and after hugging him for the last time I kept walking towards immigration. I didn’t want to turn around because I didn’t want him to see tears in my eyes. The immigration process was quick and I went straight through the boarding gates to the waiting plane. I am not sure what I did but I was still alive when the plane landed in Sydney. Human nature is very strange because you feel so much joy when you know you are going to meet someone and suddenly you can be so down when you are back alone. For us it was not too bad and I know it in my head but my heart was refusing to cooperate. After coming back to work, I made a countdown card and tore them one day at a time. I got really excited when it was down to single digits. By then AS was back in Nepal and was enjoying his days with his family. We still talked every day but we didn’t have lot of time to communicate as he was busy saying goodbye to his family and friends in Nepal. And finally it was the day before AS was landing in Sydney. I was super excited and everyone at my work knew that he was coming. I even bought a nice tiramisu cake for everyone at work to share my happiness and wrote the following email to AS. I got a cake for my colleagues at work to celebrate your coming. I took the next day off as I was going to pick him up and spent the rest of the day home with him. It was one of the most important days in my life and I couldn’t really go to sleep that night. All I could imagine was our future together and couldn’t wipe the smile off my face. Next post will be about AS in Australia so don’t forget to come back. I was excited when AS told me that he was taking me to Mysore which is 140 kms away from Bangalore, where, the grandeur and opulence of the erstwhile kingdom of the Wodeyars left a legacy that has made Mysore culturally extremely rich. Magnificent palaces, well laid out gardens, clean & broad avenues, imposing buildings and majestic temples all add up to make Mysore an interesting city. The car came to pick us up early morning and we drove to Mysore. The road from Bangalore to Mysore was pretty good, passing through highways and towns. I was looking out the window most of the time and it was a great experience watching people going to work, street vendors selling lots of food and lots of shops and markets everywhere. 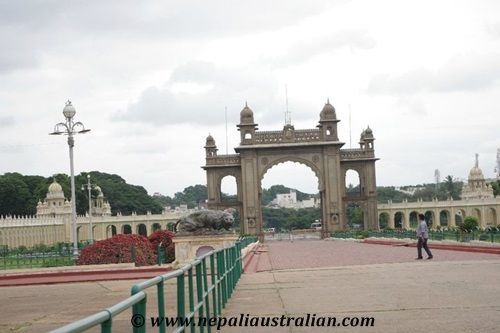 Mysore Palace or the Mysore Maharaja Palace is located in the heart of the city. 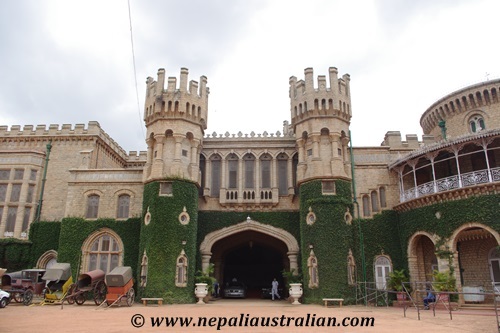 And its one of the largest palaces in the country, also known as Amba Vilas Palace, was the residence of the Wodeyar Maharaja’s of the Mysore state. The original palace built of wood, got burnt down in 1897, during the wedding of Jayalakshammanni, the eldest daughter of Chamaraja Wodeyar and was rebuilt in 1912 at the cost of Rs. 42 lakhs. 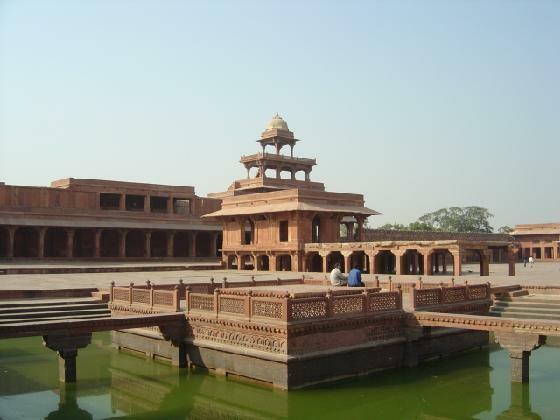 The present Palace was built in Indo-Saracenic style and blends together Hindu, Muslim, Rajput and Gothic styles of architecture. 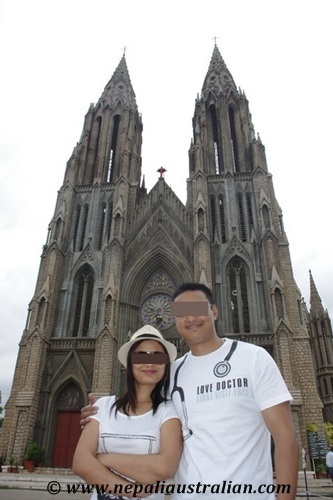 It is a three-storied stone structure, with marble domes and a 145 ft five-storied tower. Above the central arch is an impressive sculpture of Gajalakshmi, the goddess of wealth, prosperity, good luck and abundance with her elephants. 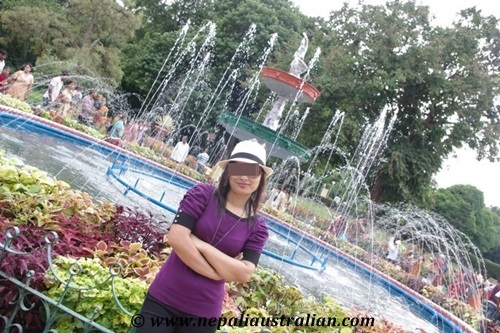 The palace is surrounded by a large garden designed by the well-known British architect, Henry Irwin. The palace is a treasure house of exquisite carvings and works of art from all over the world. When we went inside the place I was in awe as it was so massive that I couldn’t imagine some people used to call this place their home. I could easily get lost in this big space with so many rooms and such wonderful decorations of exquisite carvings, paintings and works of art from all over the world. While the palace can be photographed from outside, cameras are banned within the palace premises. They also ask to take off our shoes. We took the options of self-guided audio tours and there was so much information to take in. Looking from one of the balcony on the palace, I was also amazed by the view where you can see the massive and beautiful garden and water fountains. Once we were done with the palace, we went outside and explored the garden. There were many people but it didn’t deter us from taking heaps of photos outside the palace. 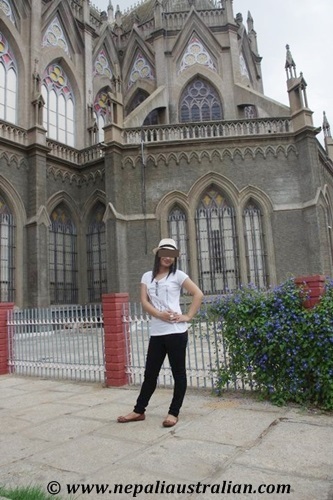 I was amazed to discover beautiful churches in India and one of them is St.Philomena’s Church, which was built in 1956 and is one of the largest churches in the country. Its inspiration is from Germany’s Cologne Cathedral. The twin spires of the Cathedral, 175 feet in height, are seen from miles around making it a distinctive city landmark. The main hall of the cathedral can seat up to 800 people and is as exquisitely conceived as the ornately crafted exterior with beautiful stained glass windows depicting scenes from the birth of Christ, the Last Supper, the Crucifixion, the Resurrection and the Ascension of Christ. When we entered the church, mass was in progress so we didn’t disturb and left quietly and instead went around outside the church, it was really beautiful. The driver of the car seemed to know all the attractions in Mysore so he made sure we got to see all the major attractions. The next stop was Chamundi temple, which has always been patronised by the rulers of Mysore. 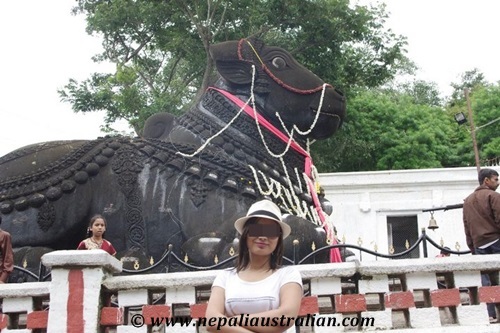 In 1659 Dodda Devaraja Wodeyar built 1,000 steps and a huge Nandi, Lord Shiva’s Bull. This colossal Nandi is one of the largest in India, 16 ft. (4.8 meters) tall at the front and 25 ft. (7.5 meters) in length. The magnificent pendent bells around its neck are exquisite. 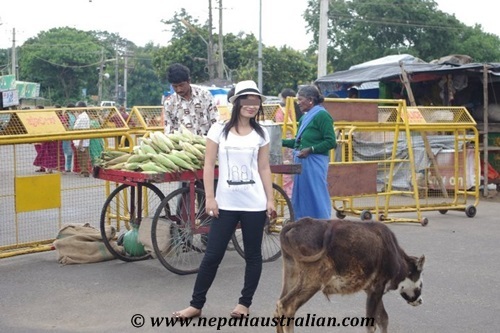 Nandi and the temple beside it are located at the 700th step of the Chamundi Hill. Krishnaraja Wodeyar III repaired the shrine in 1827 and built the present beautiful forty-meter seven storied Gopura (tower at the entrance) with gold finials and set up statues of his and his three queens. There are two other temples dedicated to Lakshmi Narayana Swamy and Mahabaleswara. Sri Mahabaleswara temple – dedicated to Lord Shiva in the form of Linga is the oldest temple on the hill. As we were coming out, we saw a vendor who was selling idols of Hindu gods. I bought a few and I still have them in our puja area. Sri Ranganatha Temple is dedicated to Lord Ranganathaswamy an incarnation of Lord Vishnu. 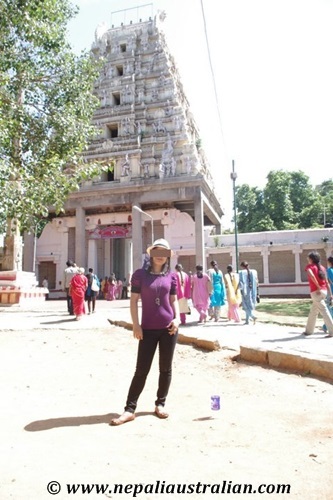 The Sri Ranganatha Temple is located on the banks of the river Cauvery in the historical town of Srirangapatna. A remarkable fact about this temple is that Hyder Ali and Tipu Sultan, two of the great Muslim kings of India were Lord Ranganatha’s devotees. The architecture of Sri Renganathaswamy Temple follows the style of Hoysalas and Vijaynagara Empire. The main entrance is beautifully engraved with 24 forms of Lord Vishnu. 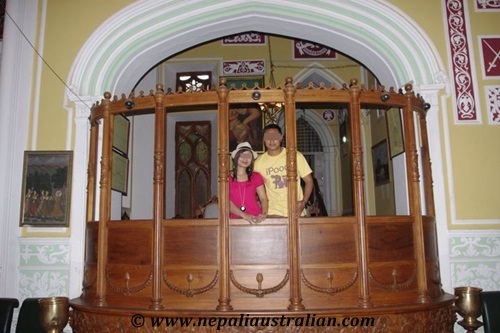 We also have similar temples in Sydney as well. There is a sculpture of a couple of well-ornamented and majestic elephants standing guard at the entrance. As we enter the queue to get into the main temple, we noticed thee a Gold Plated Garudavahana and Nagashesha. 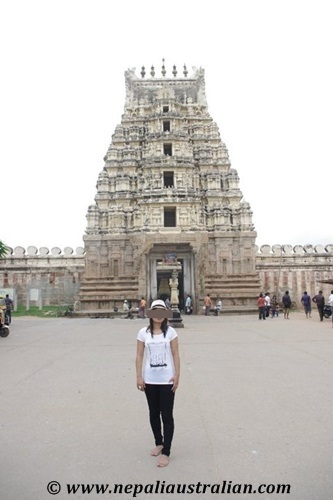 The temple has several other deities including that of Lord Venkateshwara, Narasimha and Panchamukha Anjenaya. I was a nice feeling visiting the temple and the place was well organised. Tipu Sultan, the great warrior who fought with the British empire, built tombs for his father Hyder Ali and mother Fathima Begam (Fakr-Un-Nisa). 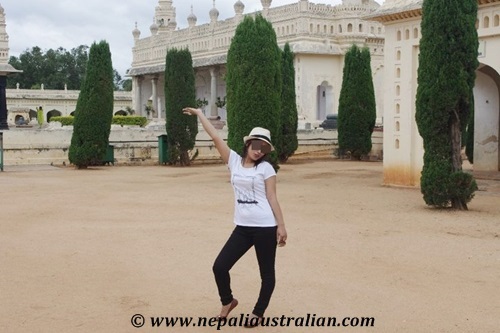 This spectacular black and white marble mausoleum is the final resting place of not only his father Hyder Ali and Mother Fathima Baigum but also of Tipu Sultan himself amongst others. The inside of the dome is spectacularly decorated and the curators will turn the lights on for photographs for a small donation to the fund. 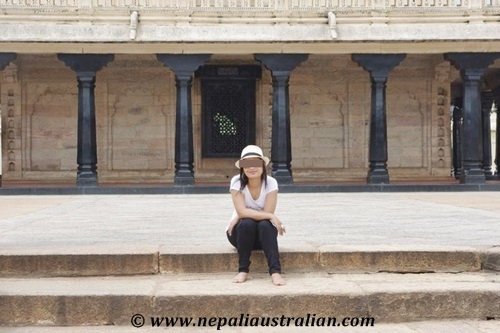 The structure is very beautiful standing on a high and wide platform with an open verandah of polished pillars all round. The highlight of the Gumbaz structure are well shaped large dome, ivory inlaid doors, and carved stone windows of fine workmanship. The chamber is painted with the tiger stripes. Adjacent to the tomb is the nearby mosque, still in operation, “Masjid-E-Aksa.” One can enter the mosque although it is necessary to cover your head. We decided against it as there were many people praying there. 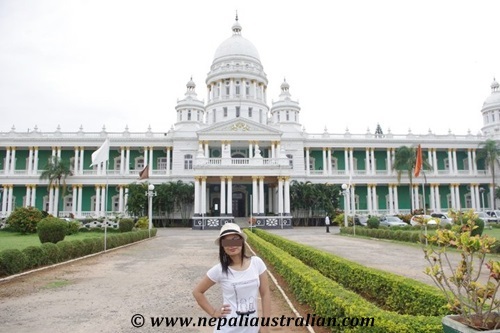 Lalitha Mahal is the second largest palace in Mysore. 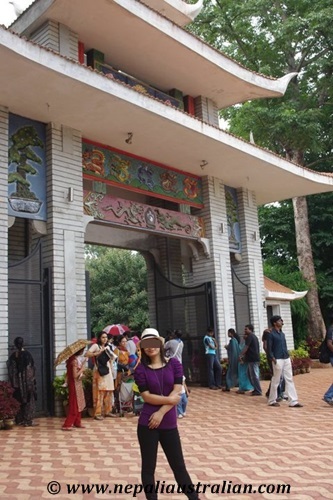 It is located near the Chamundi Hills, east of the city of Mysore. 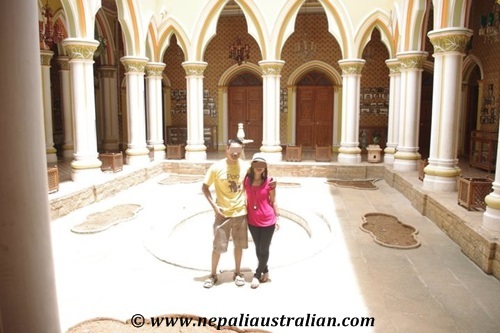 We didn’t plan to visit this palace but our driver took us there as we had time and we are glad we did. It was great place from inside and outside. Some part of the palace is converted into a hotel. For visitors it was restricted to just a few area of the huge mansion. We were informed that the palace was used in lots of movies as well. I managed to take a pic one of the guard wearing traditional outfit. After our last stop, we headed back to Bangalore. One the way back we went to a Sari shop and bought Silk saris for my mum and MIL. They both loved it when we gave it to them. The ride back felt very long as it rained and I couldn’t enjoy the view. More in the next post. Till then take care everyone. Once it was planned that I will be going to Bangalore to meet AS, I was in a super good mood. The few remaining weeks just passed by planning the trip. I had been to India couple of time before but Bangalore was a different story. First of all AS was there and everyone had told me that Bangalore is a nice place to be. I was not quite sure what to expect but it didn’t matter as AS was there and I was sure everything will be fine. Finally, the day arrived. I had a flight from Sydney to Thailand and Thailand to Bangalore. In my excitement, I couldn’t eat much on the plane. I was so pumped to see AS again after so many months. When I landed in Bangalore International Airport, all I wanted to do was collect the bag from the carousel and run to find AS outside. It was hot in the airport but I didn’t care about anything at all. I passed the immigration, picked up my bad and went to find AS. There were so many people there and the airport was really big. Everywhere there were people patiently waiting for their loved ones to come out and in the middle of this chaos I spotted AS. I just ran to hug him. I was so happy to hold him again and I was over the moon. I know I was in India and PDA is not common but I couldn’t hold my excitement. In all this excitement, I left my baggage trolley a few meters from us. Once the initial meeting was done, AS hurried to get the baggage as it not safe to leave it without anyone looking after it. AS had a car booked with a driver and he took us to our hotel. I really didn’t care what happened after that because for the next 2 weeks AS was going to be with me and we were going to have heaps of fun. The serviced apartment he booked was in a quiet street with only a few rooms. I didn’t know much of the Bangalore but AS lived there and I trusted him completely to plan of the days and take us around. We went to a nearby restaurant for dinner and just talked till late. I don’t know when I fall asleep but I had a very good rest. Rest of my time in there was fully planned by AS. There were so many things I wanted to do and see and AS was making sure they happened. He took me to many attractions around Bangalore for the next few days. We bought our ticket and were given an audio guide to take us around. The ground floor consisted of an open courtyard containing granite seats covered with fluorescent blue ceramic tiles. It also contained a ballroom for holding private parties. I wished I could take some of the furniture and paints home as they were really beautiful and I am sure very expensive. The first floor, containing an elaborate hall known as the Durbar Hall, can be reached by climbing a decorated staircase. This is a sprawling hall where the king used to address the assembly. 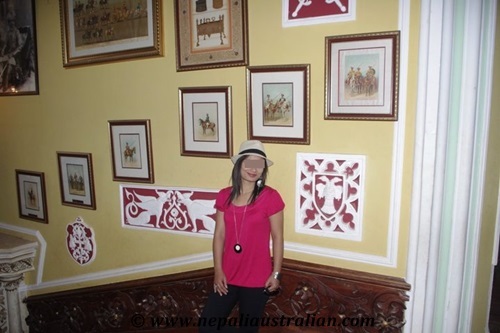 The walls along the staircase are adorned with paintings and the Durbar Hall has a massive elephant head mounted in it. One side of the hall contains stained glass windows in Gothic style. The yellow colour is used profusely and the walls and the sofa set in the hall are in yellow. A screen on one end separates the area where the ladies used to sit and watch the assembly proceedings in relative privacy. Some paintings of Raja Ravi Verma are also displayed here. The interior walls of the palace are adorned by old paintings belonging to the mid-19th century, including some Greek and Dutch paintings. 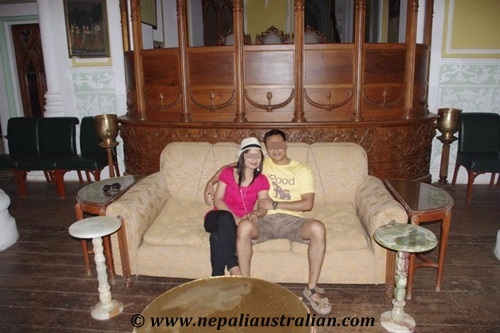 Some of the other attractions include a dining table belonging to the Diwan of Mysore, Sir Mirza Ismail. This table contained a mother-of-pearl inlay with Chinese lacquer work. 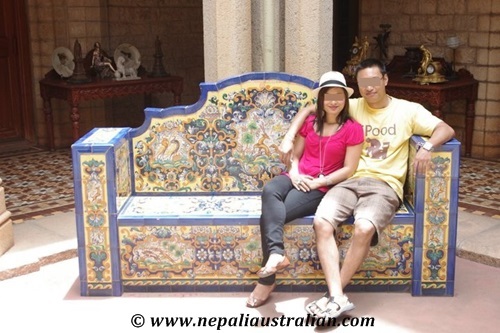 The maharajah’s courtyard has a bench and a fountain which was a gift from the King of Spain Don Alphonso. I loved that bench so much that we ended up taking many photos there. According to the audio guide, when he was deposed of power in year 1931 he visited Bangalore and found solace in this courtyard, because the columns and arches were of Moorish Architecture which were from back home. The Wadiyar’s gracious hospitality made him present this fountain and bench made of bright coloured tiles by the leading art deco ceramicist Seville. I was really amazed by the palace and could imagine how the rich and famous lived their life. When we exited the palace, we were in a big beautiful garden. I was surprised to see such a green open space in the middle of a city full of hustle-bustle. Spread over 96 acres of landscaped terrain, Lalbagh or the Red Garden was laid out in 1760 by Hyder Ali, and is now one of Bengaluru’s most famous greens. A beautiful glasshouse, modelled on the original Crystal Palace in London, is the venue for flower shows and we were lucky to be there during one of the shows. The garden has trees that are over 100 years old. It also has an aquarium and a lake. Rose garden is one of the other attractions. It seemed like a nice place for lovebirds to date as we saw them everywhere. It reminded me a lot of the zoo in Nepal where young people date hiding from preying eyes of society. 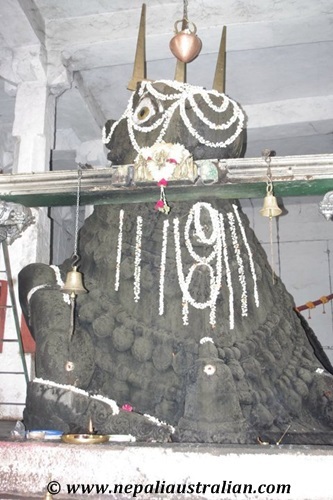 Dodda Basavana Gudi (the Bull Temple) is situated in the N.R. Colony, Basavanagudi area of South Bangalore. The Hindu temple is inside a park called Bugle Rock. The bull referred to is a sacred Hindu demi-god, known as Nandi; Nandi is a close devotee and attendant of Shiva. Dodda Basavana Gudi is said to be the biggest temple to Nandi in the world. The stone cult image of Nandi is continually covered with new layers of butter, benne in the local language of Kannada. The majestic structure of Nandi, 15 feet tall and over 20 feet long, has been carved out of a single granite rock. Outside the corridors of the Bull Temple, there is huge 20 ft high pillar which has its base adorned with relief figures on all sides. One figure is of special interest which shows a male playing a string instrument facing the Big Bull. Legends abound regarding the origin of the magnificent bull carved in a crouching position. 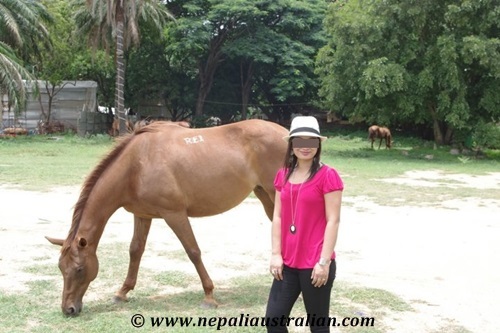 The surrounding area of the temple was inhabited by groundnut growing farmers and a bull used to graze on the flourishing groundnut crop. Enraged at the loss caused by the bull, a farmer hit the bull with a club and the bull was was transformed into a stone. Stunned by this event, the worried farmers built a temple to appease the bull of Lord Shiva, Nandi; thus originated the practice of farmers offering their first crop of groundnut as an offering to the bull. The occasion gradually metamorphosed into the famous the Kadalekayi Parishe (The Groundnut fair), which is held in the month of November. Every year, during the fair farmers offer their first crop of groundnut to the sacred bull of the temple. I went to a few more temples in Bangalore but the thing that impressed me the most was the shopping mall in there [OBVIOUSLY!!!]. We went to a few different shopping malls every day and I did find a few items I liked to buy. AS also took me to the market where they sell accessories like chura and tika and a street where they sell saris only. At the end, I bought a few saris for our mums and few for me, a lehenga set and few accessories. I wish I can go back and shop again as they have so much variety. In addition, we spent some time with AS’s friends. Some of them were really nice inviting us to their home for lunch while we met some in restaurants for dinner. It was nice to know his friends and see him in his environment. They seemed to be nice people and just happy for AS and me. Before I left, they gave me some gifts as well and I was really touched. 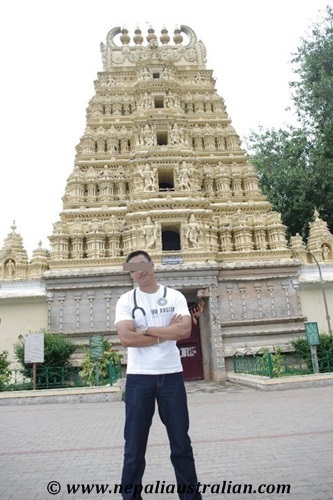 From Bangalore, we went to Mysore and I will write about it more in my next post. I was so excited and happy with the news of AS’s visa that I started counting days to his arrival. Our family and friends were very happy for us as well as they knew how much we missed each other. I was already dreaming what I was going to do when he got here. I would love to get our own place and start our new life together. But things were not meant to go according to plan and here is how one of our conversations went. Me: (All excited) I am so happy baby. AS: I know and me too. Me: So when are you going to book the ticket. AS: I talked to my work and they have asked me to work till the end of the month. Me: But that is 3 weeks away. AS: I know but I have to stay so they can give me a good recommendation for the future. I can’t just pack and leave. Me: Can’t they let you go before that? Come on I have been waiting for so long and I can’t wait any longer. AS: Come on baby, I know you want me there and I want me there too but I have to finish my obligations here before I leave. Me: I am sure you can work it out. AS: I have talked to my boss and this is the best option. AS: Come on dear, just few weeks more and I will be there. Me: I have been patient for so long and you still want me to wait for a whole month, I can’t. AS: Listen to me please, we will be fine. Now you know I am coming, start planning what to do when I get there. Then the time will pass quickly. Me: No, I want you here next week. AS: You know that it is not possible. Me: Then make it happen. AS tried his best to calm me down and finally I gave in. OK so he was coming finally and I could wait a few more weeks. Then after a few days I had the following talk with him. Me: Hey when are you planning to book the ticket? AS: Soon. 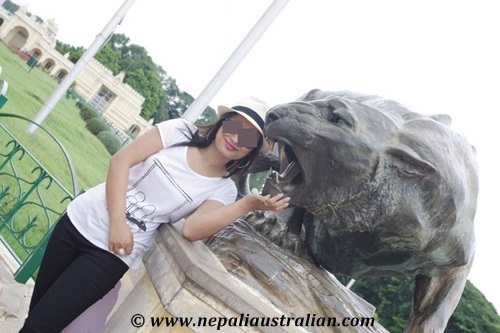 Once everything is sorted out here, I need to go to Kathmandu and then I will come to Sydney. Me: I didn’t realise that you are going to Kathmandu too. AS: I have to see my family and sort everything and I will be there soon baby. Just count the days. Me: I am sure you are not going to Kathmandu just for a few days so tell me what date you plan to be here. AS: You are not angry with me. 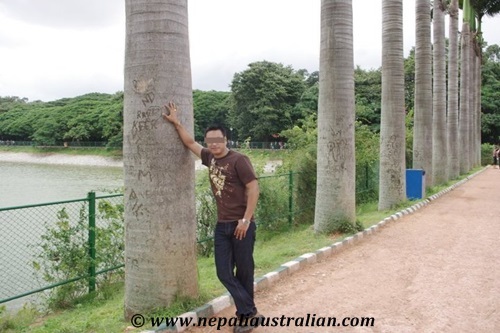 We talked everyday as he finalised his life in India and pack his bags to come to Sydney. I knew it was a big move for him as he was leaving everything he knew behind for me and I wanted to make the transition as smooth as possible. I was doing my best to give him all the information about here so he wouldn’t get a shock when he comes here. Then while we were talking one day, we came up with a brilliant plan. As he couldn’t come to Sydney so soon so I decided to go and meet him in India for few weeks. 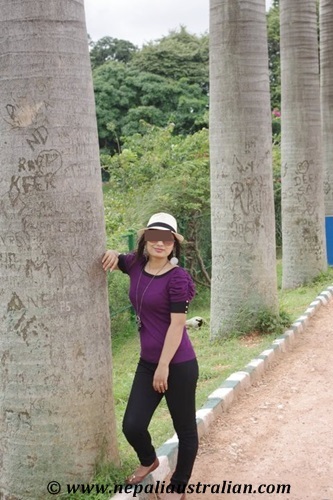 I had some holiday accumulated and I had never been to Bangalore before so it was the perfect excuse. I had been to many parts of India before so I kind of knew what to expect but at the same time Bangalore seemed more exciting as AS was there. As we talked more AS was able to take his last week off from work, so that was when I decided to fly. The way it planned out was, I would fly from Sydney to spend some time with him for 2 weeks and after that, he would go to Nepal. He would spend a few weeks there with his family and would the fly to Sydney. It looked like a perfect plan and I would be able to bring some stuff of his with me too. I was really excited when we made the plan and immediately booked the ticket and looked forward for my next holiday with AS. Next post will be my trip to Bangalore and surroundings. Again, there will be the airport and a holiday. As I mentioned before, our love story will not be complete without airports :). Does it sound strange to you? Yap I had the same feeling when it happened to me quite a few times in India. If it had been just once I would have ignored it but it happened quite a few times so I am thinking I may look like someone famous in India ;). I have experienced this a number times and I didn’t know what to do so I agreed. The first time was when I was visiting Delhi with my parents. We were visiting the famous Fatehpur Sikri in Agra in India and we were minding our own business when this group of boys came and asked if I would mind taking photos with them. For a second I was confused but then I agreed. It happened again on the same trip when we were in Jaipur admiring the amazing architecture when a young couple wanted to take a photo with me. Of course, I smiled for the photos. Both my parents and I were confused when it occurred twice in a few days. 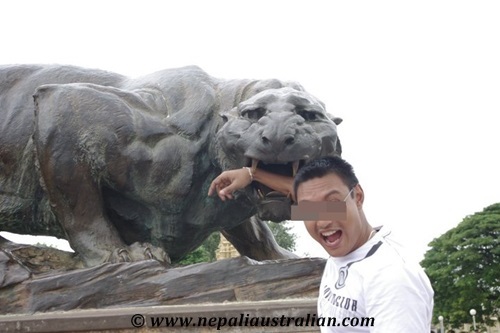 However, I forgot all about it completely until a few years later when we went to Tiger Hill in Darjeeling. It was a cold winter morning and everyone was trying to get the best spot to see the sunrise. There were hundreds of people there including my parents and I. A group of boys asked if I wanted to be in a photo with them. As it was so busy, I was slightly confused in the beginning but I agreed later on. I am writing it about it now after so many years because similar situation occurred in Kathmandu this time. I was in the mall with one of my friends. We were busying browsing the shops when two young gals came to us and asked if they could take a photo with us. They looked sweet and all so we agreed. I was just curious why they asked so once we were done, I asked them. They looked at each other for a second and then one of them told us that she just loved the way I looked and the things I was wearing; the other one added, you look so nice. That really made me smile for sure. I know it sounds so vain but it feels great to be complimented even by a stranger. But to this day I still wonder why the people in India decided to take a pic with me. Just a thought bouncing around in my head today. Hope all of you are having a great day. Take care. The lasted issue of on TNM Magazine featured Prabal Gurung on the cover with his story. Prabal Gurung had his inspirations, but it was never his purpose in life to follow anyone’s footsteps. Everyone is born different, but many of us tend to focus on molding ourselves into someone we admire, or someone the society deems a “success”. He very well could have been as big as his inspirations, but that was not what he was aiming for. Prabal was different and he knew it better than anyone else. Regardless, he wasn’t meant to be the next big thing. He was destined to become someone much greater, he was destined to become Prabal Gurung. Considering the fact that his dream of becoming a fashion designer completely contradicted the norm that benchmarked doctors and engineers as the ultimate occupation, Prabal was headed for a lot of skepticism. He was bullied for being different, and his inclination towards arts and design was never taken well by the all-boys crowd at St. Xavier’s School. But on a positive note, this just might have prepared him well to power through all the adversities of life. No wonder, today he sits high in the global fashion industry as the darling of the sensational New York fashion scene, rubbing shoulders with the A-listers of Hollywood. It is safe to say that right now there aren’t many Nepalese people who can boast of such achievements. Born in Singapore, Prabal was brought up in Kathmandu but he began his professional design career in India where he spent eight years. He then moved to New York to continue his studies at Parsons The New School for Design. After graduating, Prabal spent two years with Cynthia Rowley’s design and production teams. Soon after, he was appointed design director at the iconic Bill Blass. For many pursuant in the fashion field, this would have been considered an apex point in their careers. No one would have thought any less of him if he had decided to ride it out till his retirement. Prabal however, had bigger plans. He resigned the post he held for five years and launched his own collection – prabal gurung. After that there was no looking back and it’s been a continuous ride uphill. It is no small achievement when your brand is the choice of a variety of powerful women from the likes of Oprah Winfrey, Rachel Weisz, Anne Hathaway, Demi Moore, Jennifer Lawrence and Sarah Jessica Parker to Michelle Obama and The Duchess of Cambridge. Needless to say, Prabal Gurung’s career has already reached dizzying heights of success. Although he remains firmly rooted to his Nepali ancestry, there is no denying that India and more so New York has had a huge role in his accomplishments. Family plays an important role in every child’s development and it was no different in Prabal’s case. Prabal highly credits his mother to be his guiding source of inspiration. Considering the conservative mentality of the time period and society he grew up in, the career path he chose wasn’t going to be easy to follow. Almost everyone wanted him to conform to the basics and be normal. But his mother encouraged him through every step, and rather embraced him by convincing him he was perfect just the way he was. With the support of his mother and the rest of his family, there wasn’t much the world could do to stop his ascent. Prabal did not have everything handed to him; he had to work harder than the rest. Had he quit sketching, concentrated more on improving his grades like his teachers encouraged him to, his initials would have probably never acknowledged a second glance. With over a decade of hard work in the profession, he is now in a position where he excels at what he does and is a prominent figure in the fashion industry. Now a major source of pride for the entire country, Prabal has been doing his part to give back to the country as well. Utilizing the platform he has achieved, he along with his sister, brother and like-minded friends founded the “Sikshya Foundation Nepal” to give back to the society and education. There is no doubt that his resilience, passion and personality played a huge role in his success. There are only a handful of Nepalese people who we can look up to as having highly succeeded by following their passion and Prabal Gurung simply personifies the agenda. Not being the one to let herd mentality stir his thoughts, Prabal never let his humble origins restrain his boundless dreams. We love reveling whenever our fellow countrymen succeed in putting Nepal on the global map, and Prabal is currently the epitome of that success on a global scale. He has also opened doors to people who dare to think out of the box, and he now serves as a fine inspiration to succeed by following one’s passion. A firm believer of hard work and determination, this basically sums up his attitude towards success. 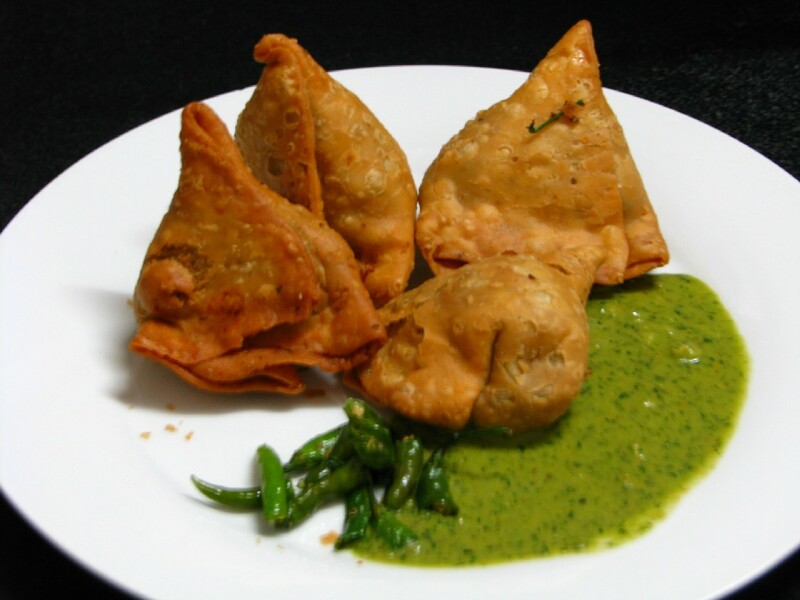 Best place to eat in Nepal? Which is the first album you remember buying? Which is your favorite workout? – I would say a cardio and weight circuit. – Vodka, soda with lots of lemon and a dash of lime. What do you always tend to lose? Something you don’t leave home without. What is your favorite rude word? – I don’t know, I guess you have to ask other people. What’s the most illegal thing you’ve ever done? – I was caught cheating in school. Do you have any phobias? – I’m terrified of heights. Any celebrities that you’ve met and couldn’t believe that you were actually meeting them? – Oprah Winfrey at the start of my career. She’s been a source of inspiration for me. I was asked to make something for her from my first collection for the cover of O magazine (Oprah Winfrey Magazine), which she was sharing with Ellen DeGeneres. She loved it and it was an incredible moment for me. And also the first lady, Michelle Obama- who’s been a great supporter of new American designers and has put American fashion on a global map. I’ve had the chance to thank her for wearing my design on behalf of the entire nation. When would you start designing clothes for men? Which men clothing line do you like the most? – Menswear is definitely in the works. I like A.P.C, Junya Watanabe, Comme des Garçons, and Dior Homme. – Non-fussy, timeless, easy, effortless, comfortable. 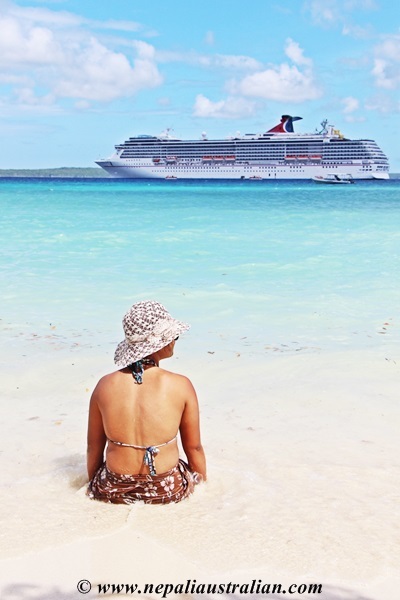 – Being a beach person I travelled to Anguilla recently and I can safely say it has the perfect beach. London was incredible experience as well since I hadn’t been there in 12 years. Are you a believer of luck? – I’ve never been a believer of luck. To me luck is when ‘Preparation meets opportunity’. Things just don’t happen. You need to prepare for things, that’s when you’ll meet up with an opportunity. Have you ever felt that you wanted to pursue something else rather than being a fashion designer? – I didn’t. This is all I’ve ever wanted to do. Life is a journey and I want to enjoy it and the process. Since I wasn’t good in studies, I was more inclined towards arts, music and creative side of things. What’s been your source of inspiration for the designs that you do every season? – It comes from everywhere – music, art, books, artists, places I’ve visited but the one thing that remains constant is the girl that I’m designing for. 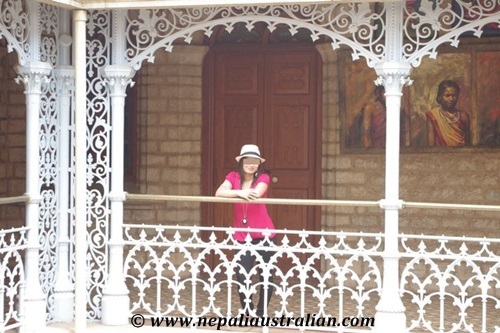 Any fond memories of Kathmandu? 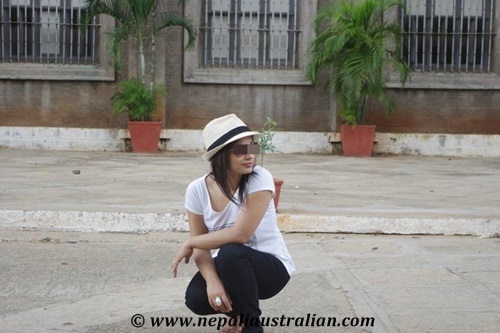 – I remember night-outs in Thamel with my brother and sister- whom I’ve always been very close, hanging out with cousins, eating ice-cream at Nirulas in Durbarmarg, listening to Madonna and going for long drives to Budhanilkantha. Kathmandu was, is and always will be an amazing place. 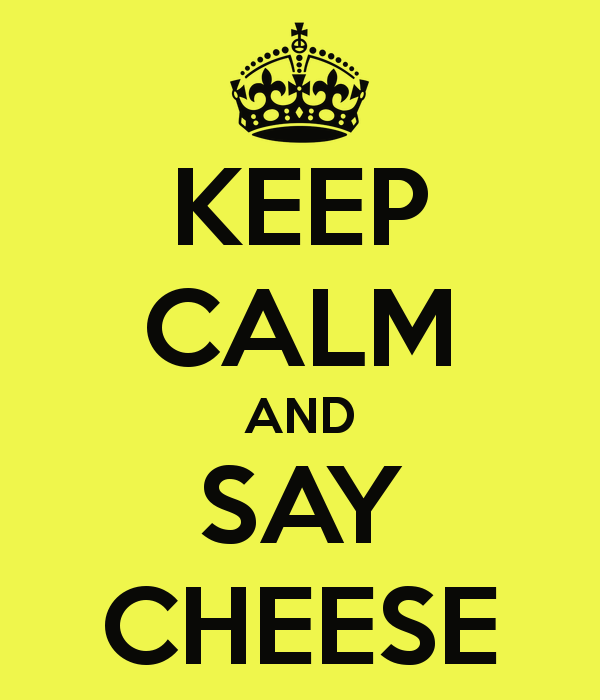 P.S : Only 1 weeks left to vote for your favourite blog. Make sure your blog and the blogs you read are nominated so they can win the title. 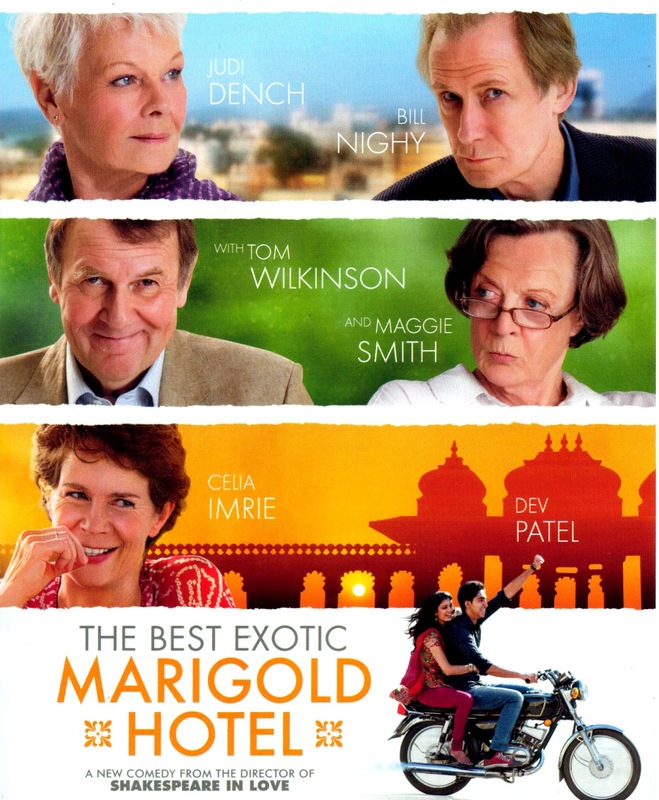 If you are up for some laugh, watch The Best Exotic Marigold Hotel. It was the movie that wasn’t in my to-watch list but I am so glad that I decided to watch it. An adaptation of Deborah Moggach’s 2004 novel, These Foolish Things, the narrative is centered on a group of older people. The story is of British retirees who travel to India to take up residence in what they believe is a newly restored hotel. But when they arrive in India, they are shocked that the resort they were expecting is nowhere near what they saw on the internet instead there stands a dubious, run- down hotel in Jaipur, India. And the story just gets better form there. Evelyn (Dame Judi Dench) is a newly widowed housewife, looking to rebuild her life. Douglas and his wife Jean (Bill Nighy and Penelope Winton) are unable to afford a more conventional retirement. Muriel (Dame Maggie Smith) is in India to have a hip replaced. While Graham (Tom Wilkinson) is a retired high courts judge: looking to reconnect with his youth. All the while, Sonny (Dev Patel) is looking to maintain the survival of the hotel and his relationship with Sunaina (Tena Desae). It is during this experience late in life, that these individuals rediscover themselves. It’s good to watch a film that doesn’t treat retirement aged people as idiots. I respect the older generation and it is nice to watch a movie which does value the wisdom and experience of older people. I really want to salute the one who made the trailer of this movie. I am not saying it is a bad movie but the trailer is better than the real movie. I hadn’t been to the cinema lately but when I saw the trailer for Looper for the first time on TV, I decided that would be the next movie I would watch. Normally I am not a big of Sci-Fi but this one seemed different so I was sucked in by the trailer. In 2044, the United States has suffered economic collapse, causing severe social decay and growth in organized crime. In addition, a strange mutation has occurred in 10% of the population, giving them minor telekinetic powers, manifested by their ability to float small objects. They are referred to as TKs. Thirty years into the future in 2074, time travel is invented, but is immediately outlawed. However, because by that point tracking technology has rendered it nearly impossible to dispose of bodies secretly, crime bosses turn to time travel to send their targets to the past to be killed using “loopers”: hired guns paid in silver to kill whoever is sent to them. The victims have bags over their heads, and silver bars strapped to their backs. When crime bosses want to end a looper’s contract, they send his older version back to be killed by his younger self, referred to as “closing the loop”. Except when looper Joe (Joseph Gordon-Levitt) stares down the barrel at a version of himself that is thirty years older, Old Joe (Bruce Willis) outsmarts him and so begins a cat and mouse chase where there are multiples of each species and most of them aren’t called Joe. I know it is a bit confusing but when you watch the movie, you will get the idea. For me the movie was good but at times it was really slow. It is definitely not an action movie but if you are into sci-fi I think you will love it. My husband loved it and I liked it so now you tell me your verdict.